Jindie Nails: Jindie Nails: Harmony Gelish gel polish-Copacabana Banana! 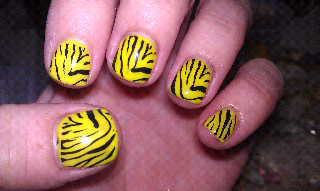 This is Gelish gel polish color Copacabana Banana with Konad zebra stamp plate #M57. I love the Gelish polish colors. This one is very sheer and needs about 3-4 coats for full opaque finish. This is 4 coats. When I do my Gel polish with stamp art, I always seal off the color with Gelish UV Top Coat, then stamp. If you wait to do the top coat after stamping and mess up on your stamp (and you most likely will) it messes up the gel polish finish. Apply Seche Vite or a similar good top coat over stamp art after you are satisfied with your stamp. With the Konad Special Polish in black (shown here) it is a mess to remove and gets everywhere! It stains your fingers and nails pretty bad. The upside to using the Konad Special Polish is that it's highly pigmented and shows up waaay better than just plain nail polish. I will post more about the different polish colors, brands etc that I have used trying to stamp and which ones don't work well & which ones do. Stay tuned, goodnight! Very cute! Now, with the gelish can you remove the stamp and redo it an unlimited number of times or does it eventually ruin the finish? Hi, thank you!! As long as you put the UV gel clear top coat on first before the stamp art, you can redo it unlimited without ruining the finish. This is the only way I do it, b/c I'm not that great at it yet. If you try to remove a messed up stamp from the gel color before your seal it with the top coat, it will for sure ruin the finish.